See our specials page for details or call us at 314-298-7300. We re figured the shower surround in this bath to make it more accessible. We used Onyx brand shower walls and pan. The pan was ordered in low profile with a ramp for the time when wheeling into the shower may be required. We added grab bars, convenience ledge, extra wide door and hand held shower wand to complete the package. One of the most popular remodel features we have to offer today is to remove the existing tub and install a shower in its place. This does require some modification to the plumbing and is not recommended for homes with only one bath. But, convenience and safety (not having to step over the tub side) seems to be the overriding factor for this featured style remodel, especially with the “Baby Boom” generation. 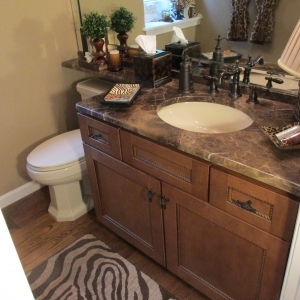 Call us today and see how we can transform your bath to meet your specific needs. ADA services available. 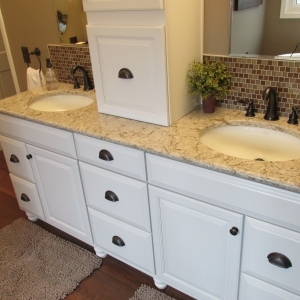 Custom Vanity Top and Undermount Sinks. We’ll take you step-by-step through the entire project. We use only proven quality products. Our installation professionals are factory trained. Dalco Home Remodeling’s mission is to be the industry leader in home improvement by providing our customers with quality products, exceptional workmanship, with courteous & friendly customer service, all at a fair price. AND, Free in home estimates. We are proud to be a member of the Missouri chapter of the BBB and you can feel secure knowing you are dealing with a BBB A+ Rated local company. Dalco has a full time inside support staff to answer your questions or refer your issues. We also employ a full time service technician to do service repairs and replacements if needed. You receive, at no charge, in home design and estimate service. Your associate will work with you in selecting your products, recommending design alternatives and assisting our inside staff to coordinate your project from start to finish. We offer a full two year labor warranty…should you have any issues with our installation, our service staff will correct the defect at no charge to you. Materials we provide on your behalf all have their own warranty periods. You will be provided upon request any documentation that may be available for each of these. Dalco….Remodeling Metro St. Louis one home at a time…Now, some 45 years and 15,000 customers later; Dalco is the recognized leader in home remodeling. Let’s look at what a few of your neighbors have had to say….